- All kids are fine, no any big problem and casualty and all children are safe in home with family. All families are in contact with LSA. - Office room is damaged. - Some kid’s house is damaged but not confirms yet who are victim because most of the kids home is far from school. All children are out of telephone contact. We are daily updating with LSA. - CLASS center office and school both damaged. - All kids are safe. - Most of the kids house is damaged they want for help tent, food, medicine etc. - Our one supported kids, Anusha magar (066/07-17/SIN/CP-11) (SIN01026) her younger 3 yrs sister died. - Our office also totally damaged. - No contact with LSA in Banepa we are trying to contact. - Not contact with LSA yet because of network problem. - But according to Kamal sir (commander) there are all kids safe. - Gorkha also midpoint of earthquake but that area is safe. - Some kids and our office home are damaged. - We are regular trying to phone LSA but no contact yet. - Sindhupalchok also midpoint of earthquake so we think there is problem. - If we connected with LSA or Any related person we update information. - Dabal Pandey have said that all kids house is damaged. - There are 150 kids support and they from different VDC and area so not confirm how many kids are in big problem. We are regular connecting with LSA. If they found any problem contact us. No family children teacher is in contact with CPCS. - It may be children/ family was victim of earthquake we are trying to collect information. - Not contact with LSA and Head master yet because of network problem. - According to Chalnakhel LSA in Pharping area there is no more effect of earthquake we are trying to contact with LSA. - School and office is safe. LSA and head master house is damaged. - Most of the children are safe. - LSA and Head master regular contact with us if they found any problem they inform to us. - LSA home School and office almost damaged. - Almost children are stayed rented house. Some kids are in contact with LSA and they inform safe. - All children are contact with LSA they are safe. - School and all kids are safe. - But most of the family are out of valley may be there house damaged. - LSA and kids home damaged. 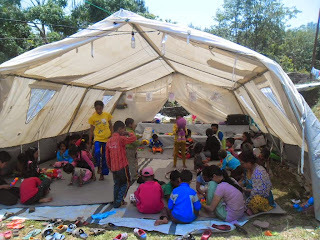 - Most of the kids are local family so they need tent and food. - LSA mobile is switch off so not contact. - According to Bijesh sir, Holchok areas almost house is damaged. - There need help because most of the kid’s families are local (Putuwar family).